Glorious, juicy organic oranges. These citrus stars are sweet and refreshing. Hard to beat as they are, or squeezed into juice. Unwaxed, so you can use the zest in cooking too. Varieties change through the season and include Navel, Valencia and Saustina. Oranges can be used in an almost infinite variety of cakes and desserts, squeezed for juice, used as an ingredient for marinades and savoury dishes. Try combining with watercress, beetroot and finely sliced red onion for a refreshing salad. 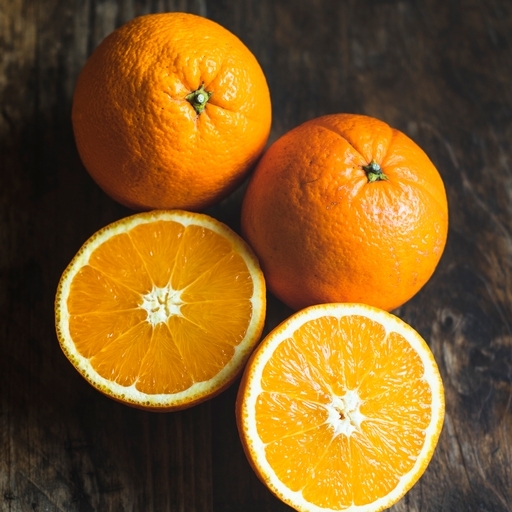 Oranges will store for up to two weeks at room temperature or in the fridge. Our oranges are sold as class 2. This means that they might not look cosmetically perfect, but they are grown for the very best flavour. (We have to tell you this to satisfy some EU rules).